Asdan specialises in life and employment skills qualifications for high and low achievers alike and its programmes have been shown to boost academic learning, too. But will schools abandon them now that they no longer count in performance tables? Dorothy Lepkowska reports. A diet of GCSEs does not suit all students and no one knows this better than Chris McShane. The head of Winton School in Andover, Hampshire, introduced vocational and skills-based qualifications after taking up his post four years ago at a time when the school was, in his words, “in dire straits” academically. Asdan, formerly known as the Award Scheme Development and Accreditation Network, is a charitable organisation and approved awarding body. It was founded three decades ago to save young people from academic failure by recognising what they can do, rather than failing them because of what they can’t. It offers more than 50 courses in key, employment and life skills in the form of short courses and workshops, and GCSE equivalents. Wrongly perceived by many to target special needs and low ability groups, in fact some of its qualifications are most popular with high-achieving and selective schools. That is why the announcement in January this year that none of the courses would carry GCSE equivalence or be featured in future performance tables came as a blow to many. Research carried out jointly by Asdan and the University of the West of England shows that taking an Asdan course has a positive effect on students at Key Stage 4. Low-achieving students who took the Certificate of Personal Effectiveness (CoPE), for example, were less likely to leave school with no qualifications and were more likely to achieve better grades in other subjects at GCSE, particularly in English. Most year 10 and 11 pupils at Winton do a mix of GCSEs and CoPE which is available at levels 1, 2 and 3. Students put together a portfolio of evidence, which includes work in areas such as the environment, citizenship, health and fitness, international links and work-based learning. At selective Colyton Grammar School in Devon, CoPE is part of the curriculum for pupils in years 7, 8 and 9. 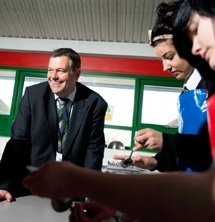 It helps them to develop a completely different set of skills from those they would develop in academic subjects, says Paul Evans, the headteacher. By accrediting students for activities they undertake outside school, such as playing in a youth orchestra, scouting or being in a sports team, it also rebuts the notion that only academic achievement is important, he adds. “If you get the personal development right academic success will follow anyway,” he believes. At Colyton, qualifications such as CoPE are also part of a bigger picture. “Students have to do things like first aid, and complete a portfolio of their interests and activities,” says Paul. “It gives them the capacity to take control and become independent learners. When they go to university interviews they are confident and have the capacity to discuss more than the three A levels they are studying for. “Our results go from strength to strength and it is courses such as CoPE that give students motivation and keep them engaged because it takes them out of their comfort zone,” he adds. The praise heaped on Asdan for its courses and qualifications by the heads that use them will come as little comfort to Marius Frank, its chief executive. He has lobbied hard for skills-based learning to be accepted as part of the curriculum and to be valued in its own right in league tables. “It is laudable for the government to want everyone to achieve, and to that end to introduce a measure such as the English Baccalaureate (EBacc),” he says. “But students need to be given a balanced education and the problem now will be that some students will be put into a heavily academic environment for which they are not suited. He admits that the take-up of Asdan qualifications has gone down in the past two years because of uncertainties over the future of the curriculum and qualifications, although schools already doing the courses are tending to stick with them. “Finland, which is held up as a model by our education ministers, is currently deconstructing its education system to fit in skills that young people will need for the 21st century. Yet we have downgraded those qualifications at a time when employers are crying out for a more flexible ‘thinking’ workforce with generalised skills not necessarily linked to one sector or another,” observes Marius. Pupils at Crofton Academy in Wakefield are offered a range of Asdan courses ranging from CoPE to an Employability Qualification, aimed at students who are planning to leave school at 16. It prepares them for apprenticeships and is used by schools as well as other organisations, such as youth offending teams. The school has been offering Asdan qualifications for the past seven years, and while it is impossible to say whether they have helped to raise standards across the board, Hellen says that they have kept some students in school when they may otherwise have dropped out. Back at Winton School, Chris McShane is adamant he won’t be scrapping ASDAN qualifications any time soon, despite their apparent downgrading by ministers. “By introducing a measure such as the EBacc, the government is asking us to go back to a curriculum that failed schools such as this one, and morally I will not do it,” he says. “I do not believe it is the right road, and the government has deliberately set on a course to undermine the quality of state education by attacking vocational courses.